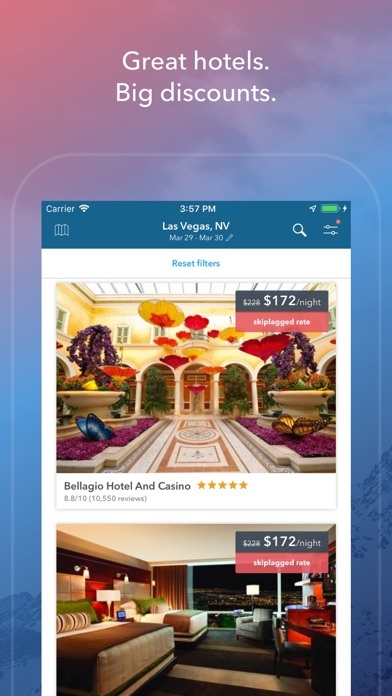 Find flight and hotel rates you won’t see anywhere else. Save hundreds of dollars compared to other travel sites. 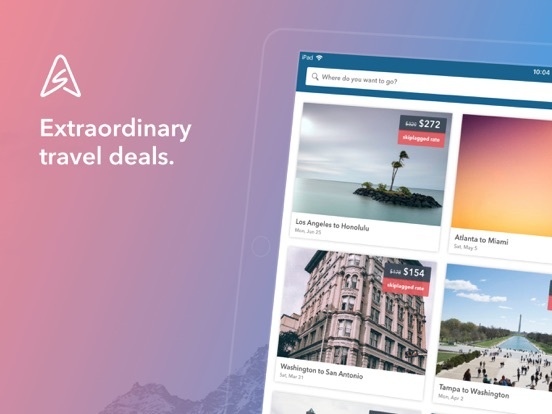 Discover extraordinary travel deals, set fare alerts, and uncover great hotel rates. We’re so good, United Airlines actually sued us for it! • Find flights other search engines won’t show you -- including hidden-city flights and arbitrary round-trips • Filter flights by duration, number of layovers, takeoff/landing time and more • Explore lowest priced travel dates and see fare changes for flights • Receive alerts when fare prices drop • Book hotels as well, including last-minute hotels and special deals • Filter hotels, read reviews and view traveler ratings The fine print: a hidden-city flight is a flight where you get off at the layover rather than the final destination. For example, a flight from New York to San Francisco might be $300, but a similar flight from New York to Seattle with a layover in San Francisco might be $200. If you’re going to San Francisco we’ll show you both flights, and if you choose the cheaper one, you get off the plane at the layover (San Francisco) rather than going to the final destination (Seattle). 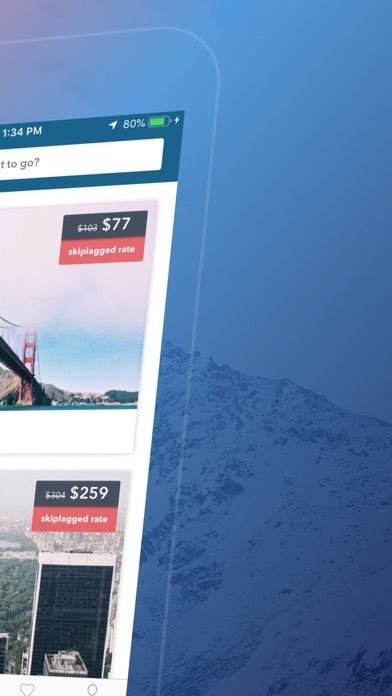 This is perfectly legal and the savings can be significant, but if you’ve never traveled like this before, you should read our hidden-city FAQ at http://skiplagged.com/faq We’ll always show you all the options, so YOU can pick the deal you want! Why I can’t pay round trip tickets together ? Exactly what my long distance relationship needed!!! I think this App is AMAZING. Maybe you guys can created a members club that can accumulate points towards cheaper flights. Besides that, love it. Wrong fares! Every time I try to check out it say SOLD OUT! 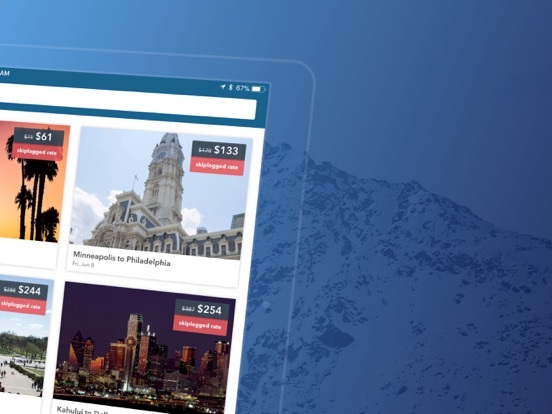 Easy-to-use app, finds affordable flights and booking through the app is easy. Use it whenever I’m looking for flights! Haven’t used the linked hotel discounts yet, but it seems like some significant savings. I have used this site for a couple of years now and there have been many times where Skiplagged will show the lowest fare being ex. $145 and when you click on it the price is $350+. I’m not sure if they don’t update their inventory properly but this makes it incredibly hard to use the app when it’s not reliable. Best app ever for people who travel often! Very easy to find ideal time to travel!!! Thank you for making finding tickets for my family. I use hopper and it is very easy. This app is not, I will stick with hopper. A friend suggested this one that they like it. It is considered Fraud to have a hidden city. Helps get good flights for weekend trips at last minute. But the hidden flights are a trap! Good app though!! Flights are easy to set up and good prices and rates ! Prices are not always what they say! I got this app and checked flights from Portland, ME to Chicago for a week in April, one month from now. The lowest fair was $60 more than Southwest. ADVICE: ALWAYS FLY SOUTHWEST AND BOOK ON THEIR APP! I also check hotels for the same week. I always stay at Hilton brands at a corporate rate. Skiplagged‘ state was $20 cheaper for the same hotel, same dates. BUT once booked you owned it - you cannot cancel or change dates; you just lose the money. This is also true for the higher priced rooms shown on Skiplagged, which were more than my regular corporate rate. 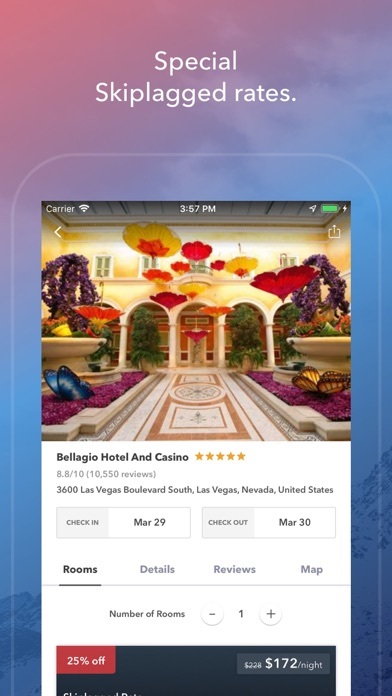 ADVICE: JOIN A MAJOR HOTEL CHAIN’S MEMBERSHIP PROGRAM, CHECK FOR CORPORATE CODES AND BOOK ON THEIR APP! Hilton is pretty good but I’ve heard Marriott is good also. If you do the cheaper hotels, some Choice brands are OK (Comfort Inn) but watch out for low quality and beware of cancellation fees with Choice brands. This is the only website I will use for airline travel searches. Prices shown when go to purchase price not available, dissipative and just fly same issues. This app never let’s me down, best prices hands down! THE BEST Airline ticket prices! I LOVE this site. I have told all my friends. I do a lot of last-minute travel and Skiplagged always finds me a reasonable price. Thanks Skiplagged! Brilliant concept too. After I bought the ticket for the first leg. The bid for the return was nearly doubled when I went to pay. This occurred in a matter of minutes. There is no easy way to contact Skiplagged to cancel the first ticket: I don’t need to go for the inflated price. Half the time I'm lost and hard to figure out what is the next step. Heck, I've still haven't found how to buy tickets, after picking the flights I wanted. I love skiplagged! I have the best luck finding cheap tickets. Wish I could give less than one star. The app was referred to me by a friend and I used it to try and purchase three tickets from FLL to LGA and returning for a short trip. The prices in the app kept changing after I clicked them, after I put in all of our information it would tell me new fees, new conditions and the price would change completely. After booking the round trip flights I get an email confirming only the departing flight from FLL for the full listed price of a round trip!!! I call to cancel immediately and United Airlines is more than helpful but because it was made through this third party app I’m still charged fees and have no actual Customer Service to speak of in regards to getting back a full refund. Never again. Waste of my time and money. I will advise anyone and everyone to avoid this scam of an app. Utter crap. As I was booking rates for my flights went up, only by $18 but frustrating that as soon as you book the flight it told me the prices for both my flights went up. So so amazing. Money saver immediately. I do not like the new update. It’s an as user friendly as previous versions. And I’m not showing hidden cities as often, looks like they may have changed something in that. Disappointed because it was great before. I love this app!!! It is my first source of flight shopping. And it makes it very clear as to how to utilize to site. Es una app inteligente, muy bien pensada para quienes buscamos diferentes opciones a la hora de viajar. La recomiendo bastante. Incluye en los resultados de búsqueda a aerolíneas de bajo costo y eso es un “plus” para la app pues no todas las app las incluyen, o al menos, no a todas. De mi parte uso Skyscanner y esta app, siendo esta app la primera opción de búsqueda por su gran particularidad que estoy seguro que a muchos nos gusta. Super fan of Skiplagged. 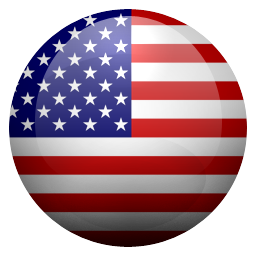 Has helped me manage my travels, in addition to providing an awesome value for money over the years. Keep pushing boundaries, you Skiplagged. Million Thanks. Use their website or app for all my flight research, it’s worlds better than what other services are offering. Additionally I contacted them for support on a flight I missed recently and they directed me on filing for a refund with the airline. Thanks! Best place to find cheapest tickets!!! I’m so excited for this trip, now one less thing to worry about ! I tried booking the ticket around 1 pm on Feb 19th 2019 and I have received a mail saying your ticket is booked and now in late night( around 1 am the next day) I have received a mail saying the ticket is not confirmed. This late night mail dosnt make sense at all. I had planned this trip and made all the other arrangements. To be frank I have my brother in Detroit and was planning a suprise visit on his birthday which is on Feb 23rd. You guys should have sent the notification earlier in such case. I kept checking the price till 2 pm and the price was the same. Now the flight price is almost hiked almost by 150%. This is a bug at your end. I have saved so much money! Amazing deals with great customer service! I love how easy it is to compare flights! Skiplagged is my knight in shining armor, my oasis in the desert, my space station in the vacuum. But the reviewer has decreased their review by four stars. I apologize for the inconvenience. Third party purchasing needs to be streamlined. Do not waste your time with this app if you need a flight on short notice! I needed a ticket two days in advance so I placed the order and was told that a confirmation would be sent in 4 hours. I set my alarm woke up and no confirmation. Called to confirm and the ticket was no longer available!!! This is the second time in a week that this happened and caused me to not only lose two days of work but I had to purchase a more expensive ticket on even shorter notice directly through the airline. Will no longer be using this application. This company should be fined for false advertisement. The prices are never the same as quoted. Skiplagged is the light through darkness of airfares! Travel smarter with it! The app was quick and easy to use. Save me some money on my flights. Maybe add frequent-flier discount? It is practically impossible to create an account on the website. Logins fail, confirmation numbers fail, some buttons/url links don't work on iOS devices...why would I even consider this service when even basic stuff fails? Smells of fraud to me! This is now a flight booking service only. If you search your departure and arrival airport that’s what it shows you. This app is not cool. If you search for a flight more then once, it’ll keep charging e rate higher and higher. I booked a flight that I had been looking at and after I booked it, the very next day there were a lot of other cheaper options that weren’t even listed the day before. App is terrible, wouldn’t recommend using at all. Excited to use this app! this app doesn’t work. shows teaser flights but absolutely no flights returned to anywhere from any major hub. 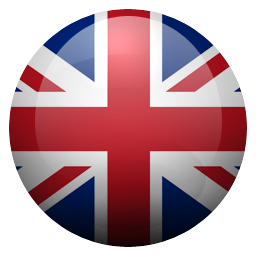 Easy to buy one way tickets in this application at the best prices. I just found out about this app and I am more then happy with it. It explains you how to get cheaper tickets and how you can skip flights. Idk who created this app but yall the bomb! Its literally my favorite on my phone!! 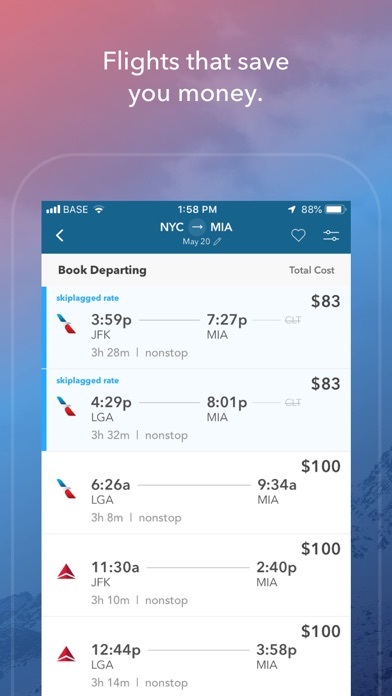 Super great app for last minute flights! Best prices than any other site! I have searched with a dozen sites and Skiplagged always gets the best prices, I don’t even bother with other searches anymore, found awesome deals at the height of spring break, saved big time, love this site! Totally appreciate your app and the good prices. Airlines are an outdated oligopoly. They deserve all the disruption that’s coming to them. Abusing them has never been so fun, and cheap!! Whoa! Best Flying App EVER!!! And I thought google.com/flights was cheap. I’m a lifetime believer so far. Found $141 DENVER to San Jose! Had to go to Philadelphia. App saved me $500 by booking an extra leg that I skipped. Super easy to find and book. Using and cherishing because when you’re in a crunch and looking for a cheap flight along came Skiplagged and boy was I glad. In July 2017 I was looking for a one-way flight to Dallas so my sister could return home. After a three-week driving vacation she needed to return home as soon as we could find a cheap flight and the cheapest we found was between $178 and $400, which was a bit out there for her. She suggested Skiplagged. We really did not know how this app worked, but I booked the next morning returning home flight at a 58% savings and waited. I was happy to pay for her ticket 15 minutes later she received confirmation of a purchased ticket and she was packing her bags to leave the next morning. Thank you for inventing this app and I still use this for other people; such as a RT ticket to New York for only $58 is a steal. So again, thanks and soon I head off to Hawaii twice. There ARE deals on this having used it a few times but it takes work and it’s not like Expedia or the other booking Apps, it’s really best using as information and guidance. 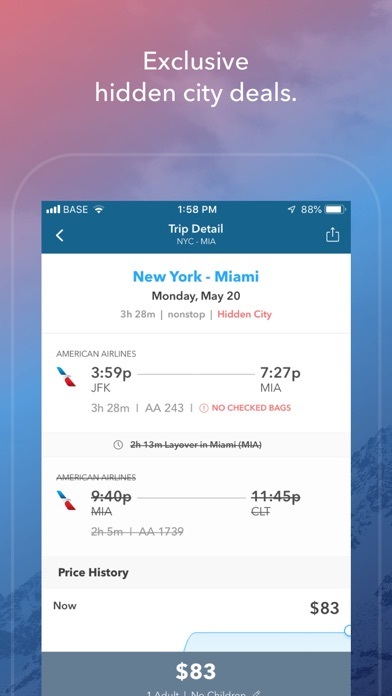 I’ve booked flights not through this, but off the airlines own sites, but use the information in the App to figure out the correct times and flights. So basically, I have the App open on my phone while booking on the airline’s websites on a laptop with different windows open. I don’t trust the 3rd party no-names this App links out to. And another warning - don’t tell the airlines that you’ve used skiplagged AT ALL. They will immediately get irate and will not be helpful. Again - use this information and book on the airlines own website - you’ll save yourself the headache. I could almost give this app 5 stars but I have to give it 4 ONLY b/c you have to, HAVE TO check out the bag policy for the flight you have chosen. A good friend of mine recommended this app & until I find a better one, this one is still my go to! If you read the other reviews, you can kind of see what I’m talking about baggage issues but, like any other 3rd parties you get flights from, you just have to read the fine print. Maybe adding banner in red letters saying “double check the baggage disclaimer in full” in stead of “check baggage details (link)” which you can get you lost & confused by the airline website sometimes kind of derails you from purchasing (you should always carry your passport when you fly anyways, just my opinion). Best deals tho!! I can’t say enough how much I LOVE this app! I was introduced to it a couple years ago from a friend who used it. I’m a bit of a skeptic so if she had not purchased flights off of it before I would think it was too good to be true. I live in Hawaii with family in TX and AZ and I travel a lot outside of the states. I have bought every single one of my flights on Skiplagged since I downloaded the app 2 years ago! I have saved hundreds of dollars and even done the hidden city flights a couple times with no issues. Just yesterday I purchased a flight to Brazil for New Years for only $1800. The cheapest price we found on all of the search engines (travelocity, Priceline, Expedia, google, etc) was $2200. I HIGHLY recommend this app!! Someone actually made it easy! I have been fed up with travel sites like Expedia, Orbitz, Kayak, and Priceline for years. It became easier to deal with airlines directly again, so I did. A friend turned me into this app to use Skiplagged and it’s the only way I book. Most of those aforementioned sites don’t do anything but put all available flights in a pile for you to sort through. Skiplagged gives me a visual map of fares and; and I swear I get my flights at least $20 cheaper than any “best price” I see elsewhere. Booking is also a snap. So streamlined I end up re-checking my flight info about 20 times because it seemed too quick and easy, there had to be a mistake right? Nope. Thanks! NEVER USING THIS APP AGAIN! I’ve used the Skiplagged app in the past to book decent flights and have NEVER had any issues until now. I found a great international flight for two people and I booked my flight and received the confirmation number for the expected cost. A minute later I received an email stating that the cost had doubled and the company needed to charge my card for the additional cost! I called customer service to report the issue and they searched my account and never saw my actual flight confirmation and tried to process the additional cost. I then attempted to cancel my flight and they wanted to charge me $150 to cancel because I supposedly “never selected the cancellation policy” which was NEVER given to me as an option when I booked. This app may have been my go-to for flights in the past, but NEVER again. I was scammed and will never book with Skiplagged/JustFly again. I’ve now flown via skiplagged all of 2018 and have had 0 hiccups. Also, might they add, they were all domestic flights and I went just with a carry on most of the flights- but no issues whatsoever. My flight even cancelled once, and I was rebooked along with being given a travel voucher 4x the amount of money I originally spent on the ticket via skiplagged. I’ve worked in the airline industry prior to coming to this app. You guys, you ALWAYS have to read fine print with ANY airline purchase. It’s not just with this app. This app works wonders, bc of it I’ve flown more outside of the airline industry than when I still worked in it! Do not use this app unless your prepared to have lots of issues. My daughter and I booked our flights to Hawaii through this app. My flight back never showed up and I didn’t catch it until I was in Hawaii. Had to do detective work to find it. Tried to contact Skiplagged but all I received was an email inferring it was somehow my fault. (There isn’t a contact number that I could find) Called multiple airlines until finally finding it myself with the help of the airline. My daughter arrived at the airport to leave and they told her she couldn’t receive a boarding pass without her passport. Skiplagged had booked the flight to Cancun as the final destination. Which we didn’t catch and there was no warning she would need a passport. We had to call the airline and cancel the flight and buy another ticket! It was a terrible experience! Will never use this app again!! Unless u want ur money stolen! Normally I don’t write reviews, but today I figured I’d make an exception. Yesterday I went to use my return flight only to find out that they (Skiplagged) cancelled my flight back bc I didn’t go to the final destination! After hours of being at the airport trying to get this sorted they said this is the real reason airlines hate Skiplagged bc they get people stranded and take their money all the time. So now I have to pay 500 dollars that I really don’t have on top of the 160 I paid already so I can get home tomorrow and that’s with an 18 hour layover leaving today. So today should be fun >< I can’t find a phone number to reach anyone and I emailed them and haven’t gotten a response back! I want my money back! U can’t just cancel someone’s flight, leave them stranded, and take their money! I love this app and I’ve been using it for some time now. I appreciate not having to go through other sites such as Expedia, which by the way Expedia and other travel sites raise prices for your travels after they see you’ve been searching. Skiplagged, however, is reliable and to the point. Most of the services will be booked through other sites such as official airline sites. The app simply searches for the cheapest possible combination for you. 10/10 would recommend for finding cheap flights and hotels. After using this app in the past, it was excellent. Now it seems as if you can’t purchase a roundtrip ticket together anymore, even if it’s on the same airline. Why should I have to buy two one way tickets on American Airlines? It's so good to have a slider that will give you the best day(s) to fly. 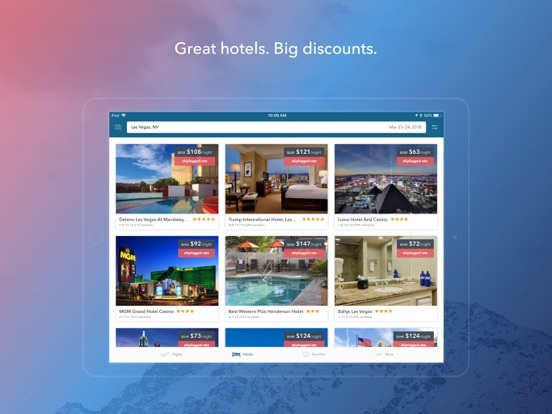 The big airline industry and other online travel sites dislike this App, and I can see why. The secrets are out, no more paying for over priced flight. I would not change a thing. Please keep up the great work. Found a price for a round trip to Montreal from NY After I booked the departure found that the return flight is double the price on the website Contacted support (email no phone number) and explained that I had better offers for the departure form NY but chooses Skiplagged because it was less expensive and asked them to offer a discount but they didn’t even answer me ! They admitted having a mistake on their website and never got back to me ...disappointed ! This app used to save me real money on flights to overpriced airports like PHX. Apparently the developer sold out to the airline cartel and is now competing with Expedia, etc. as a 3rd-party booker of fake travel “deals”. Just look at the search results you get now- most of the flights shown are actually to the city you’re trying to get to, for $2 or $3 off whatever is considered the going rate. Then they throw in a couple skiplags that cost more than the direct flights. Please ignore the obvious shills raving about the current version. There’s nothing left about this app to make it worthwhile. Hopefully someone else picks up the ball and creates a skiplagging app that does what this one used to do. I work in human rights and international development aside from that I just really like to travel this website and it’s a company in app are fabulous in finding low-cost airfares. Well planning my wedding I have booked the majority of the flights for all my friends and family through this website I wish I could get a commission but it’s better to keep the prices low! I always check a number of sites when booking travel for myself or my college-age daughter. I consistently find the Skiplagged site to be the best for fares, flight availability and flexibility for us. René K PS My husband is a pilot for a major carrier and there are times when flying stand-by works for us. 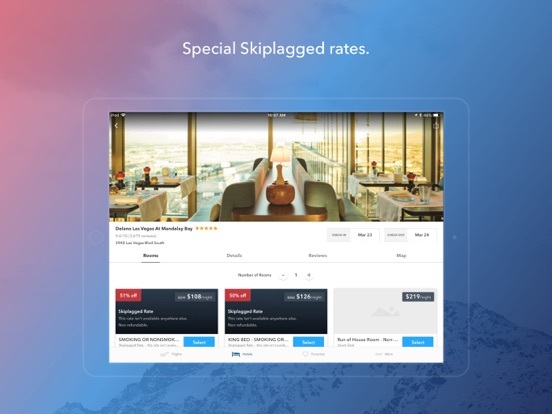 But when we need to book to ensure a seat for a wedding or event, even vacation, Skiplagged is my number one travel planner! A family friend passed away yesterday and I was torn because I really wanted to fly home (from Phoenix to Detroit) but last minute flights during spring break season are unaffordable for me. A friend told me about Skiplagged and I went from $600+ to $300 RT. The fact that I can now fly home (assuming I can get out of work) means a lot to me. Thank you, Skiplagged! Also, the app is really quick and easy to use. A bonus! We use this app to check prices for flights and their graph showing prices versus dates is excellent. I would like to give them the business and book my flights using their app but it rarely works. After entering all of my data, when trying to book, I get an error message telling me to correct the info in the red field. The problem is there is NO red field, so I am unable to book. I then go and use the info from Skiplagged and book using Expedia. I’ve been a long time user and fan of Skiplagged, but now I noticed they charge you a "service fee" if you book through them. I was charged an additional service fee of $65 for a flight, and that money could have gone into a better flight with a more convenient departure time. I feel ripped off. 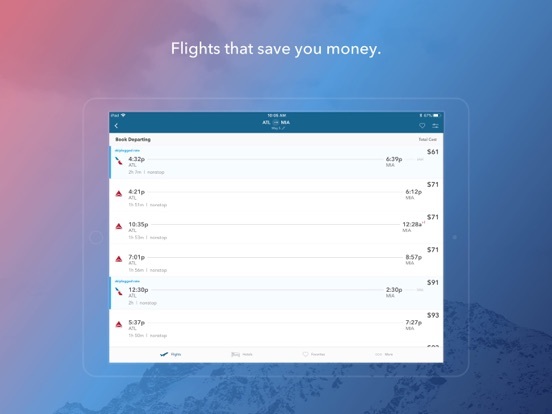 If you use this app, my advice to you is find the flights you want then open up your web browser and book the flight directly from the airline. I’m deleting this app after posting this review and warning others not to use it. Beware that you are giving your bank card info to third party merchants! fortunately, I saved 20 dollars on my flight but the google price was around twenty dollars more than the Skiplagged third-party (fourth party rates). Most of the time, the prices on the source airline’s website are nearly identical to the Skiplagged “deals”. If you don’t mind talking to 5 separate operators on a customer service level phone call in attempt to “speed up the card verification “ ; go ahead, download Skiplagged and save a few dollars. Crazy easy to book and wow, what savings! As far as the app goes, it’s crazy easy to use! I booked flights in minutes vs the 30 -60 mins I spend searching airline sites and travel sites. This is my first time using their services so I cannot comment on that but as far as the app goes, they do a great job of explaining how to book flights and what to expect. I booked a flight and they put my name incorrectly on my reservation. Unfortunately I didn’t notice until I went to check in online for my flight the day before. When asking them to correct, they said I had to talk to the airline directly. The airline was not able to correct my name and I ended up paying an additional $108 to rebook the flight with my correct name, not to mention getting stuck on the phone with an international airline for over an hour. When asking Skiplagged to refund me this cost, they provided no response. Do not recommend!!! The very first time I used this app, it was due to me missing a flight...I had to purchase another ticket but couldn’t find accommodations...In distress I called my brother and he told me about skipplagged...The rest is history...Time and time again it proves to be the answer to ALL my flight and travel needs! The best flight app hands down!! Best place for flights. Period. I refuse to use a different website or app. They are without question the best and that’s why I’ve been using them for years. Love how they show the amount you’ll pay (taxes and fees included) so I’m not sticker shocked when I go to buy a flight. So easy to compare different airlines and filter different options. LOVE Skiplagged. Made me a global traveler. Im a college student and this app and their awesome last minute finds have allowed me to buy last min one way trips to Mexico, Lithuania and wherever I desire. 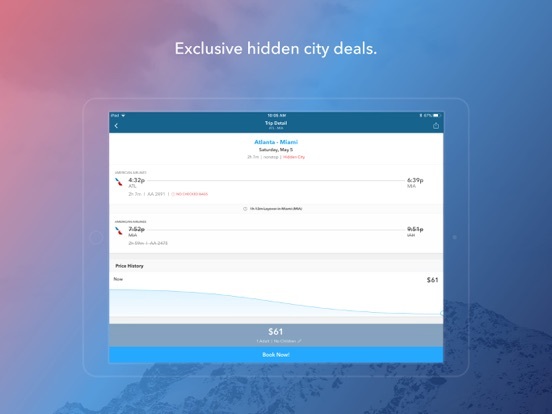 Not sure what is up with their website right now, but this app and service have been my secret to finding the cheapest flight for a long time. Awesome product thanks! Every time I have purchased a ticket Through this app has been successful. I used Hopper once, And they did not successfully purchased a ticket for me. I had to purchase it a week before the trip when the price difference was terrible. This app is reliable and a plan my trips based on good rates. I am completely horrified! I booked tickets on this app for the holidays to see my family in Portland OR. My flight to Portland was easy and non stressful. When I got to the Portland Airport for my flight back to Los Angeles they refused to let me on my flight back, saying they “oversold flight” they also refused to give me a refund, because I purchased my flights on this app. I have never experienced such unprofessionalism in my life. I will never use this app again!! I lost $200 and ended up having to purchase a ticket with an airline back! Worst experience. I was skeptical of using Skiplagged at first. I do not have experience with booking/traveling with actual “skiplagged” tickets, but the prices for the standard tickets they offer are dependable and can’t be beat! Just confirmed a Virgin Atlantic Booking from NYC to London for $264..that’s unheard of. I’ll be keeping my eye out and testing future deals. If you fly, and are flexible with times, you need to check Skiplagged. It’s my first stop when buying tickets. You don’t always see the skiplagged price, but when you do, it’s a score! Drawback is no checked bags, but if you want to jump on a plane with little luggage, it’s definitely less expensive! I have found many cheap flights with this app. I don't even use the airlines' apps anymore except for boarding passes. It would be a little less clunky if instead of showing the little price graph, a calendar or date-timeline with the minimum price shown. Highly recommend! I just booked my third trip since May through Skiplagged. It continues to save my life. All in all I’ve saved over $1,000 in the last 8 months. Be careful of the bag policy. I was forced to check a bag on one trip. Fortunately my husband was passing through the state where my bag landed. All in all it’s worth the risk if you pack properly. Love! 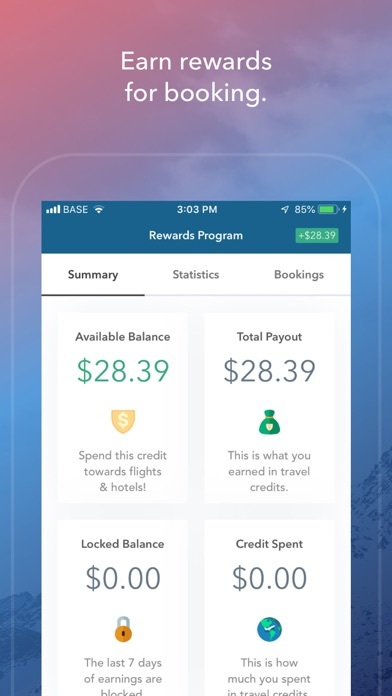 In the skiplagged app it lets you put in your credit card and info in a way that makes it seem like it relays that info to the designated airline you selected and your reservation will be done through the airline website...instead, they say your trip is “booked” with known scam site ExploreTrip and say Skiplagged no longer is responsible for what comes after. You then have to wait four hours for your ticket confirmation, if it ever comes. I’m still on phone waiting. We discovered them during the news coverage about their low prices and they’re definitely the lowest! They compare all airlines. Found it best to look at one ways first. We recommend them to everyone and now everyone we know uses them!! I check every flight I book against skipplagged and the app has saved me at least $1,000 on various flights over the past 2 years. It’s definitely worth using and remember if you book a flight that’s skip the lag, don’t check your bags!!!! FIrst time user and it went great!! I usually use google flights to track and find cheap flights. 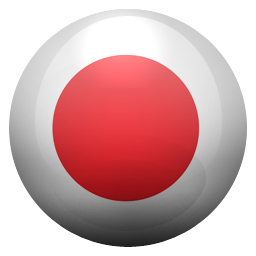 This app is just as convenient but with cheaper rates (Skiplagged rates). The only pitfall is that you cannot travel with checked baggage. 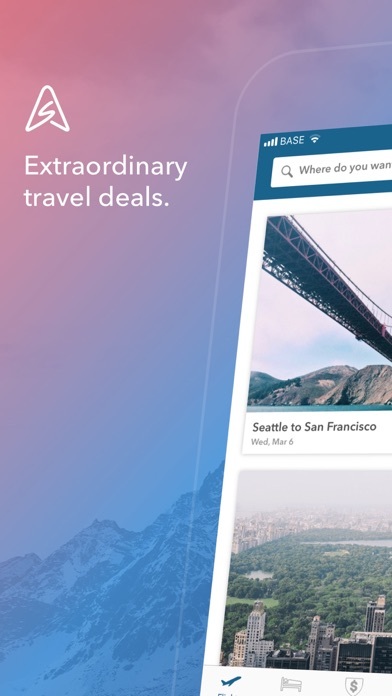 This app works well for quick getaways and turn-around trips. This is my go-to travel/airline ticket app! It ALWAYS has the cheapest and most reliable flights out there. I have yet to find another site that helps me book my ticket like this so regularly. The forecasted flight rates help me make my last minute travel plans more confidently. I had to fly out west for a funeral and needed a cheap flight very quickly. The app tells you that there is a possibility that you may need your passport due to the final destination of the flights being out of country. The app, however, never gave me the final destination. Because all of the other flights heading out west were national flights, I didn’t bring my passport with me. I can’t go home unless I buy a brand new ticket because the final destination is Toronto and I don’t have my passport. so happy I downloaded this app! my flight was cancelled in LAX so I jumped on this app to book another two tickets to Colorado for Thanksgiving & I found the best & inexpensive tickets in as little as 5 to 10 minutes. I was surprised that it was that cheap because it was literally the evening before Thanksgiving. THANK YOU! !